How wonderful it is to see so many of you here today. 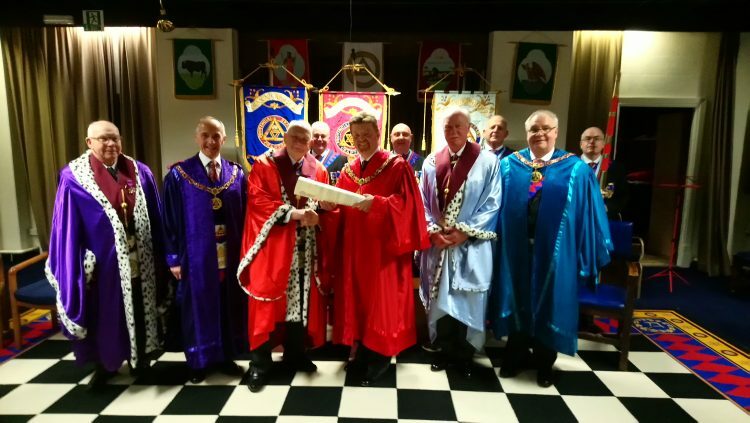 Companions, you are all Principals or Past Principals of your respective chapters and are really the true leaders of this wonderful province of Warwickshire. I thank each and every one of you for your time and your support in being here this evening. We number over 160 which again very similar to last year so I am pleased and honoured that the popularity of this event continues, despite, or perhaps in spite of, the inclement weather outside. So companions we’ve had a most enjoyable time over the last 12 months of Warwickshire Royal Arch Masonry. I hope that many of you will have been able to watch the short video I did as a New Year message, a break from tradition and in which I talked about some of the events that have taken place recently and I don’t intend to reiterate all of that again. Suffice it to say we’ve had all had some great fun, with lots of laughter and just a touch of solemnity when appropriate. My fellow Provincial Principals and I have particularly enjoyed the opportunities, not only to attend at the installation meetings regularly supported by many of the acting Provincial Officers and OOTY’s whom I thank wholeheartedly for their support, but also, and in some respects more importantly, to attend the exaltation ceremonies throughout the province over the last year. We had 30 exaltations in 2018 which is a little disappointing as it represents a drop on 2017 but on the positive side resignations were 50% lower than the average over the last 6 years. But as regards exaltations we must all re-double our efforts Companions as the aim must surely be to see every Chapter enjoying the fun and pleasure of an exaltation at least once a year. We will continue and find ways to attract any brother who has yet to make that final step into RA Masonry. 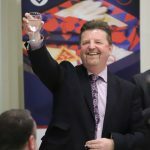 The Roadshows provide a very informal introduction to RA masonry and with the next two on the 28th Feb in Warwick and then again on the 5th March in Coventry, there will be another opportunity to bring along a brother and introduce him to the colour and spectacle of RA Masonry. I thank the PrGM and all the Craft Executive for their continued support in attracting brethren to RA masonry. 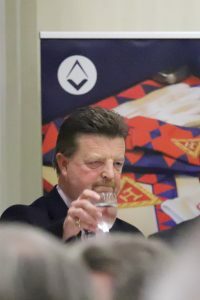 The Craft as a whole has gone through a number of changes and is certainly putting great strides into the various initiatives that have come from UGLE. 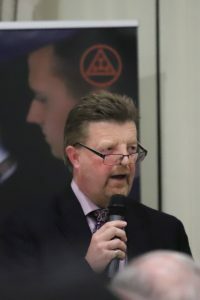 These include of course the Pathway project, which really does take a candidate through the various steps of his Masonic career from entered apprentice through to becoming a RA Companion and if carefully followed it will have a tremendous impact on the success and enjoyment that every candidate will experience in Freemasonry. 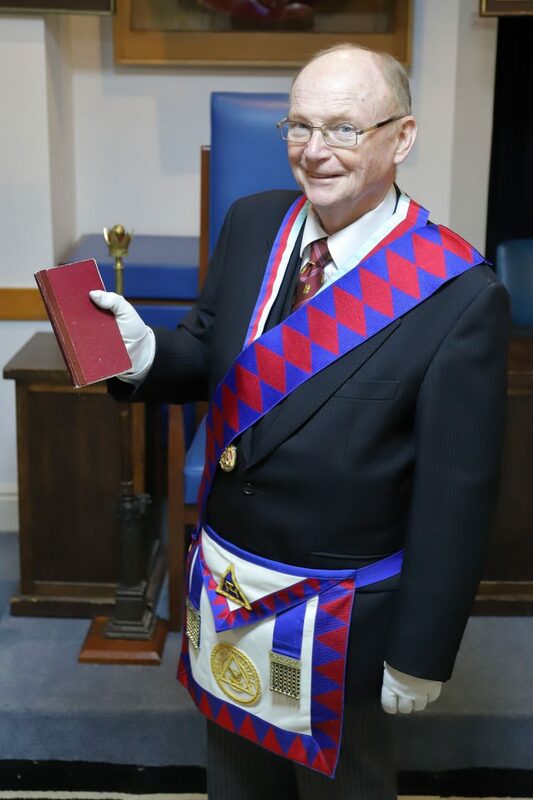 The recently launched Solomon project carries this a step further because Companions we’re all going to enjoy our freemasonry all the more if we understand it all the more and Solomon is an amazing resource that we really all should be embracing. If you’ve not yet had an opportunity to look at the website, then please do make the time – I promise you that you can’t fail but to be impressed. It divides into four sections, the Entered Apprentice, Fellow Craft and Master Masons and of course a large section on the Royal Arch. The articles are well written, they are not overly complicated. They are informative and gentle in their educational approach companions. It would be so pleasing if on every summons for every chapter at every meeting a small item of labour was devoted to the delivery of a nugget from Solomon. They are appropriately called nuggets as they each take just 3 – 5 minutes to deliver. If we had a companion in each chapter who was confident in the way that he could present and read the nugget then that kernel of information regularly delivered will gently start to grow thereby improving all our knowledge. I can’t help but think that that will have a profound and lasting effect on retaining the enjoyment and ultimately the interest, and therefore the membership of our companions. We work very hard to attract new members and we must, of course, work harder still to keep them. 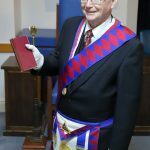 We do have a problem though in the Royal Arch, as we do in Freemasonry generally, and that is the inevitable and inexorably increasing age profile. I think it’s fair to say that looking around the room none of us would consider ourselves to be in the first flush of youth. That causes us two problems. First the inevitable effects and consequences of anno domini. Secondly, companions if we do succeed in attracting a brother younger in years into our order then we as the senior members of the Province, and I mean all of us here are the leaders within our chapters, must recognise that we have to work especially hard to make that younger companion feel comfortable and welcome. As yet we do not have a university-scheme affiliated Chapter but that is something we will consider in due course but with all the efforts the Craft is going to to attract younger members there will in due course be a flow of younger men into the RA. If the topics of conversation around the dining table are all about our latest ailments and what pills and potions we are using to try and keep certain unpleasantness at bay then frankly the 28 or 30 or 35-year-old Companion is probably not going to feel part of that conversation. His difficulties and challenges will be to do with juggling his work, his family, his money, and the daily commute. We must be aware of that and must look for those areas where we do have things in common and engage in those conversations and dare I say share the wisdom of our years. Where you are lucky enough to have younger members, you must you must really nurture and truly mentor that you young companion so that he enjoys it. Equally importantly he is then likely to bring more of his contemporaries into our Order. Companions I am conscious that there appear to be so many new initiatives around. 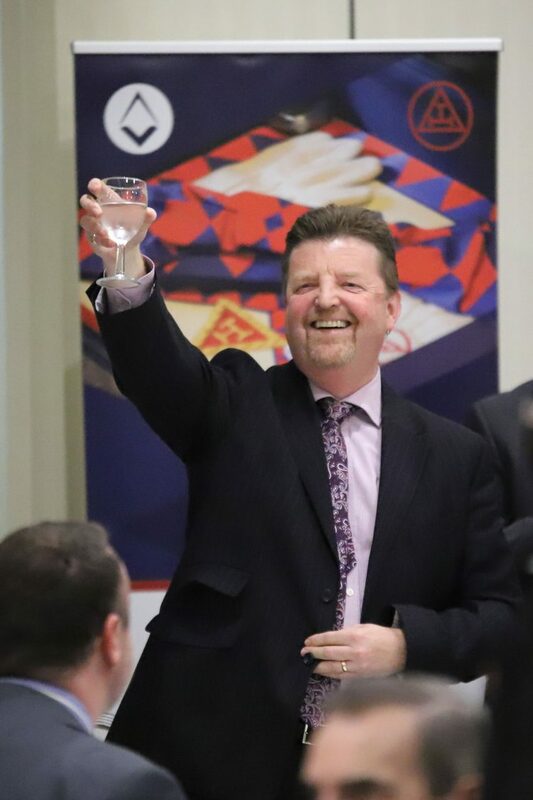 I am sure to some extent we’re all suffering from initiative overload what with Solomon, the Masonic Rooms initiative and the Pathway etc, but they all boil down to the same objective which is to improve our enjoyment of Freemasonry. That’s why we are all here, to enjoy ourselves and let’s not forget that for one moment. We all see differing standards of Ritual across the Province in all the orders and I know some rue the loss of the ‘good old days’ when perfect standards of ritual were commonplace. But the demands on our time have changed, the world has changed and I think men have changed so that where perfection is attained it should be applauded but let’s equally praise the Companion who within the time available to him has made every effort – not perfect but none the less admirable. Remember the idiom, ‘to walk a mile in someone else’s shoes’ means before judging someone, you must understand his experiences, challenges, thought processes, etc. In effect, it is a reminder to practice empathy. A truly masonic concept. Companions, I am all for embracing modern technology where appropriate and I came across an idea promulgated by Leigh Chapter who are celebrating their Centenary later this year. The Chapter is now using WhatsApp as a means of communication between Companions within their Chapter. This is excellent and demonstrates how we can all benefit from improving communication through the use of technology. Those who don’t know what WhatsApp is, please come and find me or E Comp John Emms and we will talk you through it. I am a member of various WhatsApp groups for my family and it seems logical to encourage Chapters to form groups for themselves. 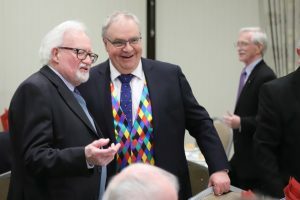 It is a quick and easy way for the Companions to contact each other and as the Chapters meet infrequently, it would encourage everyone to keep in touch on a more regular basis and foster a greater feeling of being part of a Masonic family. As you may know WhatsApp is a secure and closed group. 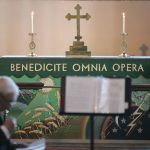 Talking of Centenaries and a few other parish notices. I am very much looking forward to attending Yenton Chapter where the MEZ E Comp David Old, our senior Past DepGSupt will be conducting their centenary meeting on the 28th February. Please put the date in your diaries Companions and come along and support the Chapter on this rare and remarkable achievement. Companions, The Chapter exaltation support team lead by E Comp Mark Phillips is still available for you to use. The experience for a candidate, but also for a Chapter as a whole is so much improved by a well-supported meeting and with all the offices filled. Mark, with a little bit of notice, will be pleased to come along and support the Chapter, along with a Provincial Principal, so please bear this is mind. Charitable donations to the WRABF increased by around 48% in the last 12 months and I thank you all Companions for your generosity. 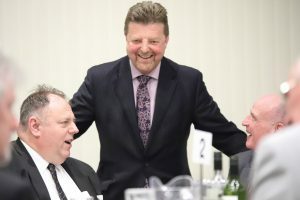 The donations we are able to make in your name are so important and the hard work by the all the trustees of the BF should be duly acknowledged. Please continue to support the Ben Fund with at least one donation from your Chapters each year remembering that we are also in festival and the RA is an active supporter of the 2023 festival. I am delighted to announce that the new Warwickshire Royal Arch website is now up and running. It has had a complete makeover with a more modern image and functionality. It is now entirely responsive to the device you are using to look at it and more importantly we can now control it ourselves with the ability to update it with articles and information. At present, E Comp David Graham and Andrew Armbrister have been trained in its use. Companions this is your website and will only be interesting if you provide article and events which we can put on it. There is an automatic upload of news to both Twitter and Facebook so it is easy to share details of any events you wish to share. All you need to do is send an email with the news item and photographs to either David or Andrew and leave it to them to do the rest. The web address is unchanged at www.royal-arch.org.uk. Companions it is customary during this address to advise you of the Companions who will be the Provincial Principals for the coming year. 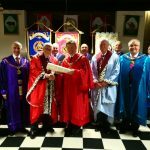 In a break with tradition Companions, a habit I seem to be making, I am pleased to confirm that the current Principals will all remain in office for the coming year. Each of them has a portfolio of responsibility that requires time to properly undertake and I am grateful to E Comps Gough, Emms and Starley for all they have done and are continuing to do. Their support, advice and ideas are invaluable, and I think we should all congratulate them for all they do Companions. Finally, a big thank you to our hardworking Prov GSE and his assistant for their tremendous efforts to make tonight the success it has been. David and Gary do a significant amount of work in the background and I am very grateful to them both. Enough of me Companions, I hope you are looking forward to the quiz and have already identified all the baby photos, I thank Peter Sorrill once again for compiling the quiz, I know it is not a five-minute job. Companions please continue to enjoy your RA masonry, and may God be with you all.